Dr. Petra grew up in Austria around horses. She started riding at age 4 when her father bought her a very opinionated little Shetland pony mare named “Sheriff.” Despite initial challenges with Sheriff, a deep bond developed between the pair. Sheriff became Petra’s first teacher in her journey with horses. Over the years Dr. Petra, not only developed a passion for riding, but also for working with horses. Originally an equine sports massage therapist for 7 years, Petra made the switch to animal chiropractic after observing the amazing benefits animals gained after being adjusted. She was fortunate to have studied under several gifted mentors for more than 15 years. She received her Animal Chiropractic Certification through the OPTIONS FOR ANIMALS program in Wellsville, Kansas in 2008 and is certified by the International Veterinary Chiropractic Association. 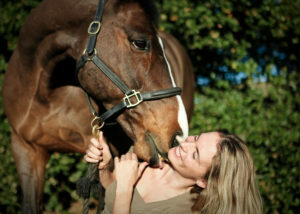 In 2000, she received her Equine Sports Massage Certification with the prestigious school of Equinology in California. Additionally, Dr. Petra has studied under some of the greatest names in the world of horse health, such as: Equine Biomechanics with Barb Crabbe, DVM, Equine Nutritional Management with Dr. Robert E. Bray, and Advanced Saddle Fitting with Dr. Kerry J. Ridgeway, DVM and Master Saddler A.J. Foster. To further her skills, she has participated in multiple Equitation Clinics with Major Miguel Tavora, Master of Equitation and protégé of Nuno Oliviera. And, Dr. Petra is currently completing her Diplomat in Chiropractic Neurology at Carrick Institute.